Make cake batter as directed on cake mix box, adding gelatin with the water. Divide batter evenly among muffin cups (about two-thirds full). Bake 22 to 27 minutes or until toothpick inserted in center comes out clean. Cool 10 minutes; remove from pan to cooling rack. Cool completely, about 30 minutes. Meanwhile, in medium bowl, beat powdered sugar and butter with spoon or with electric mixer on low speed until well blended. Beat in vanilla and 2 tablespoons of the milk. Gradually beat in just enough of the remaining milk to make frosting smooth and spreadable. Divide frosting among 4 small bowls. Stir 6 drops yellow food color into frosting in one bowl. Stir 4 drops red food color into frosting in second bowl. Stir 6 to 8 drops blue food color into frosting in third bowl. Stir 4 drops yellow and 2 drops red food color into frosting in fourth bowl. Frost 6 cupcakes with each color of frosting. Poke 4 or 5 white vanilla baking chips, flat side up, into frosting on each cupcake to look like polka dots. Store loosely covered. Have fun making other colors and flavors of cupcakes by using lemon, lime, strawberry, raspberry or watermelon gelatin. Try paste food color! It can be purchased at cake decorating and craft stores. The color is more concentrated, so a little goes a long way. 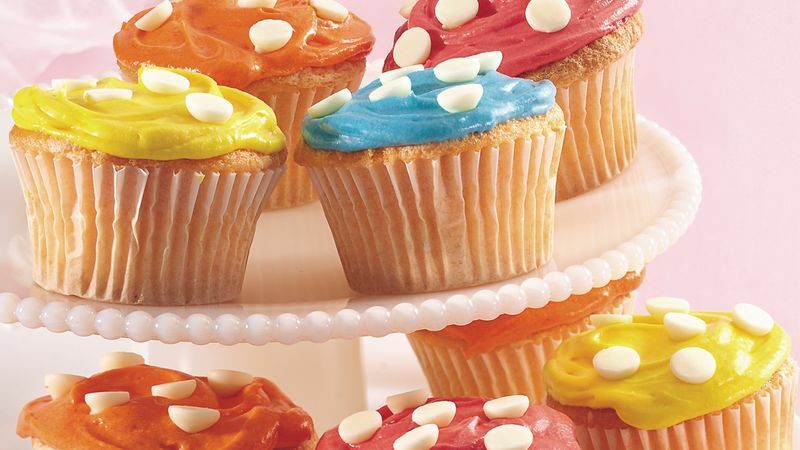 An easy way to frost cupcakes is to carefully dip tops into the frosting, give a slight twist and remove. Finish off with a swirl of a knife if needed.